Frank Booth feels a little like Paul Revere — he is trying to sound an alarm to alert people of an impending threat. The threat is not from an external army; however, but from self-created dangers to our own health when we allow ourselves to succumb to a sedentary lifestyle. Booth’s warning: Chronic disease is coming. Booth, PhD, a professor in the College of Veterinary Medicine’s Department of Biomedical Sciences, recently published research that investigated whether there is a genetic predisposition toward inactivity: http://munews.missouri.edu/news-releases/2013/0408-couch-potatoes-may-be-genetically-predisposed-to-being-lazy-mu-study-finds/. 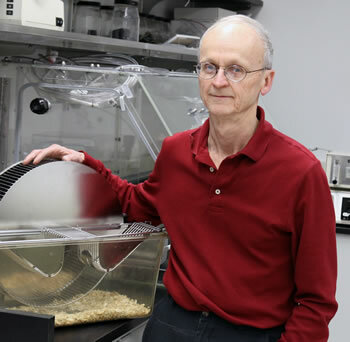 In addition to pursuing his own research projects, he has also spent much of the past 40 years examining the studies of other scientists and synthesizing the data about exercise and the link between inactivity and disease. During his career so far, he has drafted 79 review articles in which he has analyzed the information available on various topics from studies within the exercise and physiology field as well as external sources, and offered recommendation for the next needed steps in research. Booth said over the years his reviews have evolved from examining studies of exercise alone to documenting inactivity as a growing public health crisis. The American Physiological Society recently paid tribute to Booth for the scientific reviews he has authored with its Annual Reviews Award for Scientific Reviewing — the first time it has presented such an honor. The award was given for excellence in providing systematic, periodic examinations of scholarly advances and provoking discussion that will lead to new research activity. He received the award during the Experimental Biology 2013 conference in Boston on April 23. The meeting brought together members of six sponsoring societies: American Association of Anatomists, American Physiological Society, American Society for Biochemistry and Molecular Biology, American Society for Investigative Pathology, American Society for Nutrition, and American Society for Pharmacology and Experimental Therapeutics. Booth said that while many people are unaware of the health problems that an inactive lifestyle can trigger, the topic is beginning to gain traction in the media. He hopes an increased focus on the topic of inactivity will help educate Americans to reject a sedentary lifestyle, especially for the sake of their children’s health. He said scientists can’t hope to make public policy, but they can make their discoveries known to the policy entrepreneurs who can enact change.